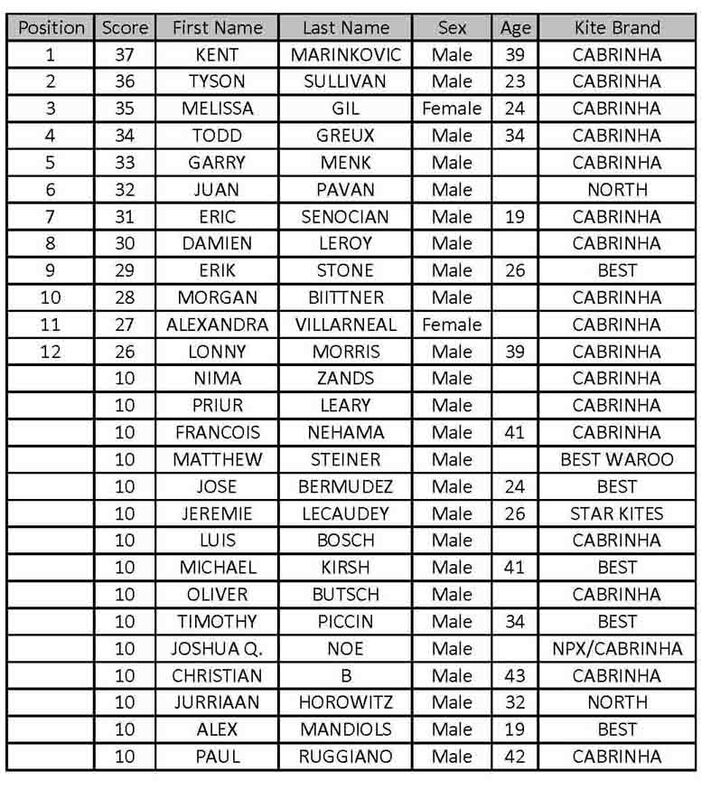 Here are the final complete results for the 27 contestants participating to the Fowey Kite Race in Crandon on Sunday March 3rd. 12 only crossed the finish Line and scored according to their position. The 15 others riders couldn't make it upwind back to North Beach due to a strong current and lighter wind. Nevertheless, as per our Points system to implement a Ranking of riders after all the race we will run Monthly, they still obtain the 10 points participation bonus. More pictures to come. We are working on the video of the aerial images, derushing for now. don't have the whole race though couldn't keep the pilot to stick to the entire race for 2hrs + ( $$$), but the views angles are pretty cool. Best to all the riders in this first time event. Sorry I missed out this time, next year! Thanks for putting this together Christophe, great idea. Any idea when you may run another?? Didn't hear about this one until few days before. Not that you can plan the wind but if you had a rough idea of when the races where going to be. You could draw people from outside the miami area. There has also been some talk about running some races(course races) in the Tampa bay area, but haven't seen anything materialize yet. "A race will be scheduled every month in Crandon until the summer starts ( June 21st). A High-points scoring system has been launched yesterday, to determine a ranking at the end of those races. We will award a winner for each of the following categories: Men , Women, Youth ( under-18) and Senior ( Over 45 ) . Prizes will be distributed from the 1st to the 3rd in each series. Each riders entering the races will receive Participation Points Bonus, whether they finish the course or not. This is to reward those who make the effort to attend all the races. It also takes in consideration the amount of riders for each race . Therefore yesterday all of you get at least 10 points for participating. Next race by end of March tentatively between the 23rd to the 29th . April Race will be during MIAMI KITEBOARD MASTERS on April 12-13: the Sunday will be the amateur Open Race. We expect over 50 contestants on that day. From all over the USA."